Bring the Museum to your classroom! Our Traveling Trunk program brings docent-led presentations in science, art and cultural history into your classroom. For more information contact lmiller@monmouthmuseum.org or call 732-224-1992. Which Of These Trunks Would You Enjoy? UNDER THE SEA – Marine puppets and seashells will bring the ocean and the seashore to your classroom. Preschool - K.
DINOSAURS – Learn about Dinosaurs by seeing and playing with Dinosaur figures. THE RAIN FOREST – Discover what animals and plants live in the rain forest and why rain forests are so valuable. COLONIAL AMERICAN LIVING – Learn about what life was like during the late Colonial Era. 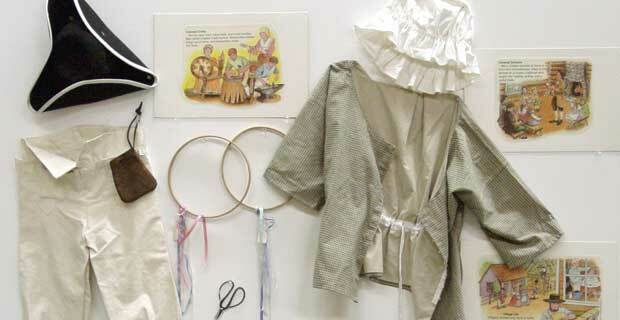 Colonial reproductions such as clothing, lanterns, early eating utensils, childrenʼs games and much more. All items are described and explained. area. This trunk contains many Indian artifacts and information about how they lived, hunted, and dressed. NEW JERSEY – This trunk explores the geography, history, folklore and fauna of our unique State. different kinds of New Jersey seashells are presented. HABITATS – This trunk explores various habitats of our world including the Arctic, Desert, Woodlands and Rain Forest. Specimens and footprints are available to view and touch. FOSSILS – Find out how ancient animals and plants became fossilized and what fossils can tell us about the past. CALL THE MUSEUM AT 732-224-1992 TO RESERVE YOUR TRUNK TODAY! On the Brookdale Community College campus Phone: (732) 747-2266 • Fax: (732) 747-8592 E-mail: lmiller@monmouthmuseum.org website: www.monmouthmuseum.org.